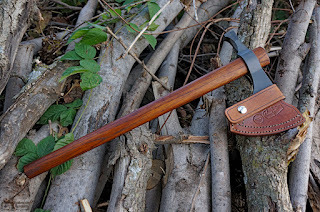 There are many tomahawk makers in the US and I think from a sales perspective there are a few primary reasons for it when compared to true American poll axes. That's poll, not pole. 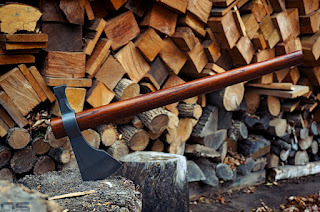 And, in fact, there are few small shops regularly making axes at all in the US, even with the popularity of Gransfors Bruk and others like them. 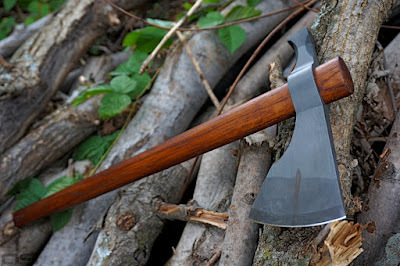 For one thing, a real axe, particularly when you're talking 2lbs or more, uses a lot of steel - 2lbs or more I suppose. Of course that gets us into axes made from two types of metal, and the possibility that they are therefore more complex to make, but there are many hawks made in this fashion still today. I think it could simply be that people have fewer and fewer uses for an axe and so two pounds of iron - or more - just isn't something many people desire. 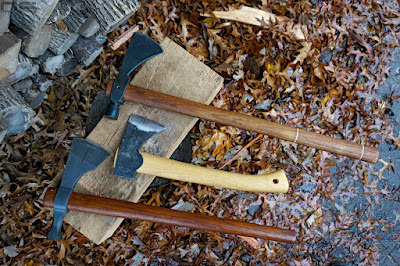 When the largest use for an axe today is in the woods by campers, hikers, bushcrafters, and general outdoors enthusiasts, there isn't much a person can't do with a hand saw and a hatchet. 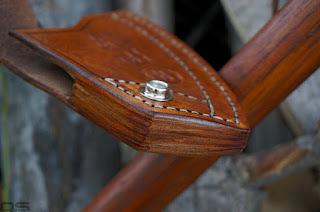 Welt tapers with the bit. Hatchet is really the key. Hatchets aren't exciting. They are the most mundane in the edge tool category really. Axes are exciting because they built a nation of wooden homes, felling huge trees all along the way as America grew. They are iconic, often specialized to their task, and unique to their region, giving birth to a vast catalog of patterns. Tomahawks evoke images of early America as well, of woodsmen and trappers, combat, and the native people of the country. Today, they are wrecking tools, breaching tools, and fighting tools. But hatchets, they ride in the back of the station wagon for yuppie camping, or at the chopping block where chickens go to meet their makers. They are for making kindling - rectangular, wedge-shaped objects that aren't really good for much of anything else. They aren't purpose built, they are strictly utilitarian and really they only come in one pattern. Sure, there are a few hewing and carpentry hatchets, but that pretty much covers it. Estwing gave the world some nice curves, a sleek design, a stacked leather handle, and changed the face of the hatchet for a lot of people in the process. But there hasn't been anything since. At least, not in the hand hatchet category. Gransfors Bruk realized the axe industry was a sinking ship in the 80s and if I can be allowed to speculate, took the most iconic American pattern, the Jersey, and shrunk it. 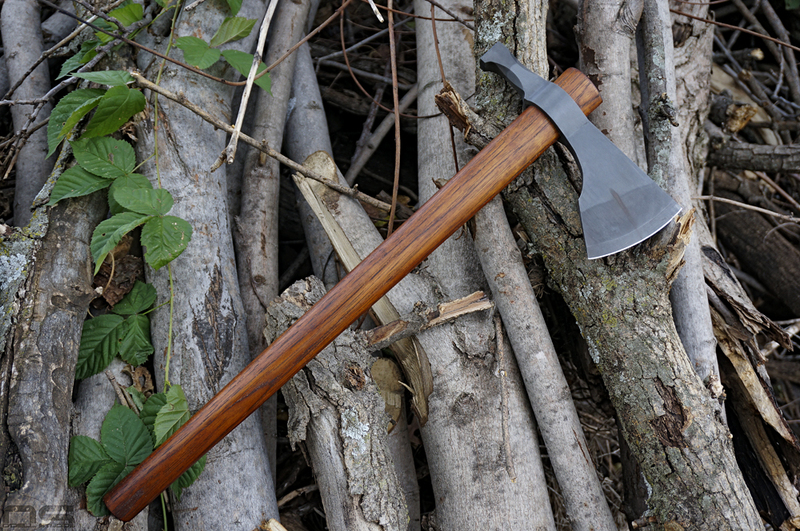 By that time the Hudson Bay pattern already existed as the outdoorsman's axe, a light head on a mid-length handle - longer than a hatchet, shorter and lighter than a boy's axe. 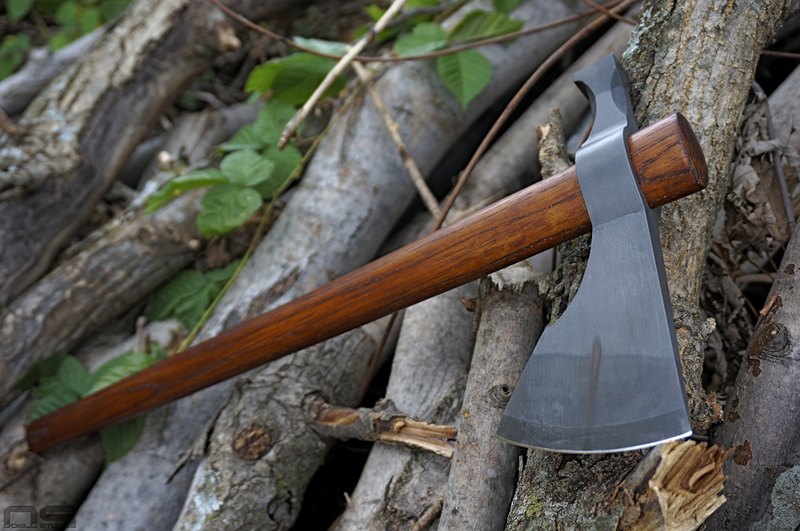 Gransfors, with their shrunken Jersey pattern breathed new life into the concept with something very similar to a Hudson Bay - the Small Forest Axe. 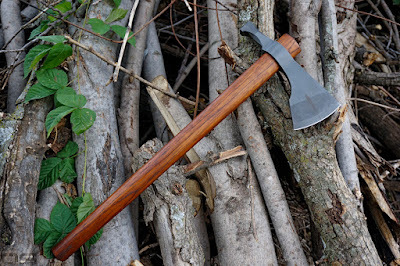 I think the relatively recent rise in popularity of outdoor activities and in particular Bushcrafting, has driven the popularity of things referred to as axes, that are really modified, more attractive, and even more versatile hatchets. Note the bit geometry similarities. What does this have to do with tomahawks? Well, when you look at these "axes" you find that they are not much different from a tomahawk. While I do believe there is room for more of these modified hatchets in the US, they are somewhat limited to campsite duties. Or at least, Bushcrafting duties, which certainly can be a wide range of activities. However, tomahawks stretch into other arenas. 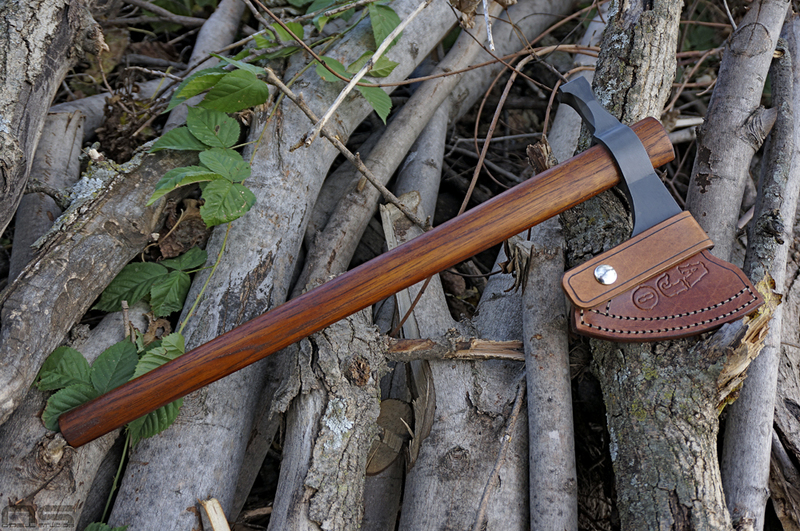 They practically beg to be thrown, they can be historical or tactical, or even both with the LaGana Vietnam hawks. If you're into destruction and demolition, something about a tomahawk urges its wielder to smash. And, they are widely available in an almost endless combination of features and designs. 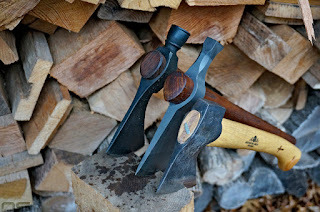 While axes and tomahawks share many obvious similarities, its the presence in the hand where the differences are found. To tie it all together we're going to look at the Walk by Faith Tomahawk today, and compare it to the Gransfors Bruk Wildlife Hatchet. I think it's more effective to do comparative reviews like this because more people can relate and mentally associate what I am talking about with their own experiences. 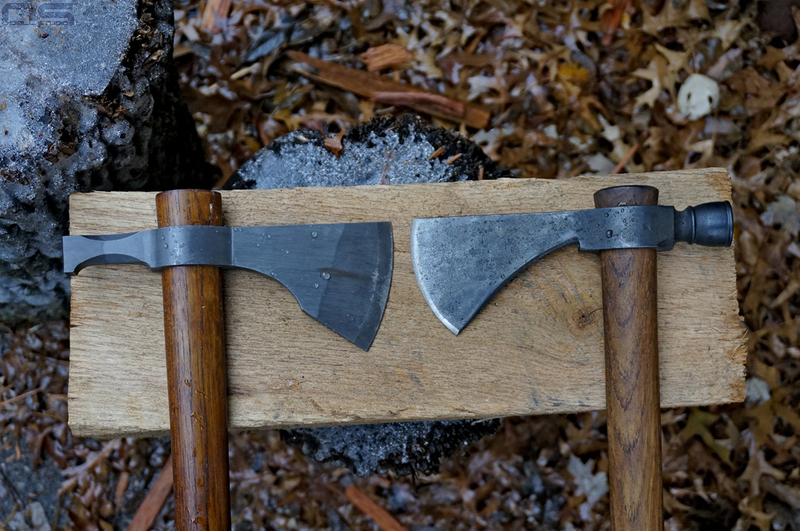 I have chosen the Wildlife hatchet because it is ounce for ounce, the most similar to the Walk By Faith tomahawk, and tomahawks in general, and you will see the geometry is very similar as well. First things first - value in today's market. $150. It's the magic number at the time of this writing. It seems the Gransfors products have risen somewhat in price, and I have heard (with zero effort on my part to confirm) that the Wildlife hatchet is or was difficult to get. Whatever the case, I spent two whole seconds checking Amazon for the price of a Wildlife hatchet and they wanted roughly $150. Now, Gransfors has its share of critics within the vintage axe community, but I personally believe they are unfounded. They are not drop forged, they are forged on what I understand are called open dies. The bottom line is, the dies (multiple) help shape the hot steel into the final shape as the power hammer strikes it. Dies are necessary (at the very least) for a consistent, high volume product in the 21st century. The point, they are handmade. Some people will argue the definition of handmade until they pass out, but a skilled person has to use his hands to control the process of taking a hunk of steel and beating it into an axe - in a production facility. It is not custom, it is not hammer forged on an anvil, it just is what it is and I respect their process. In many ways I can understand criticizing anything "boutique" but the use of that term has begun to aggravate me with respect to Gransfors Bruk. Take a look around you and ask yourself how many craftsman went to work with their hands and skills to create anything you own that cost $150. Most labor in production today involves unskilled assembly, packing and button pressing. So to be perfectly honest, I don't think $150 is especially expensive for a Gransfors axe. It's not cheap, it's just the price of a quality tool. Council Tool gets the same kind of money and while I can go buy the Black and Decker tool for half the money of a Makita, it's simply the difference between a quality tool and a throw away tool. There are axes hanging in most big box hardware stores for a fraction of Council or Gransfors, and they are a fraction of the quality. Boutique to me has to fall under the category of expensive for the sake of being expensive and that's simply not the case for GB or Council. Now, Walk by Faith gets $150 for their tomahawks. So we're talking about good steel, hand forged, sharpened, finished, hung, with an amazing sheath for essentially the same money. Regardless of my opinion of the production market price for Council or GB, it is the market price and so for a full step up in every check box, Walk by Faith is offering an excellent value by the market's standards. Let's get into the pics. Check the fit of the handle to the head - flawless. Smeared with goobers from some testing but a very neatly made hawk. 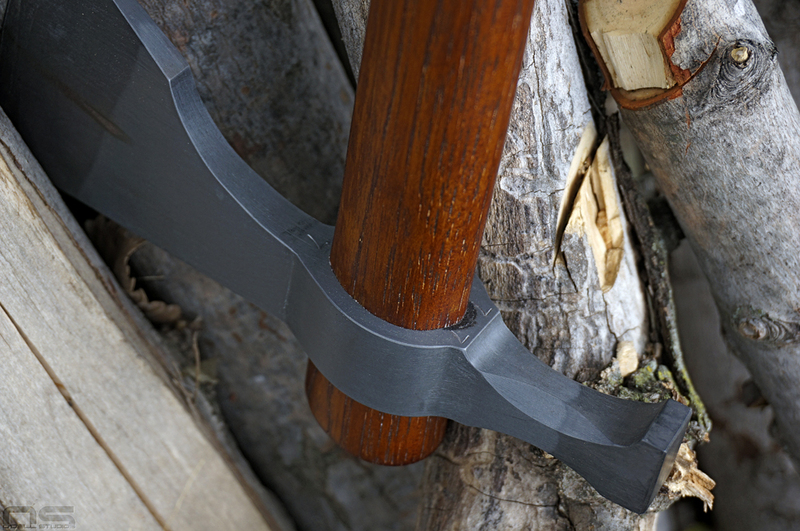 The Gransfors Bruk Wildlife Hatchet weighs a total of 1lb, 5oz. 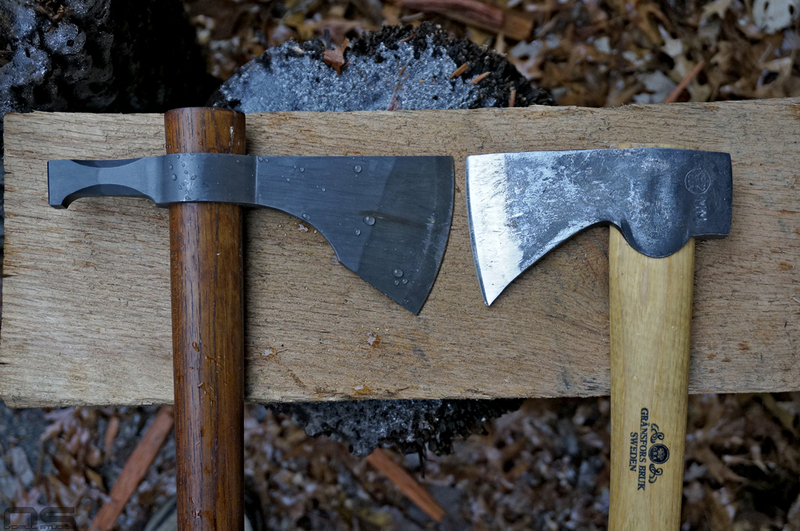 The Walk by Faith Tomahawk weighs 1lb, 9oz and finally the Cold Steel Pipe Hawk weighs 1lb, 11oz. When I look carefully at the WBF and the Wildlife hatchet, I can't help but wonder where those 4 ounces are exactly. There might be a couple ounces difference in the handle, but in the end, there just isn't much weight difference between the two. The biggest similarity in all GB axes is how tomahawk-like the bits are. 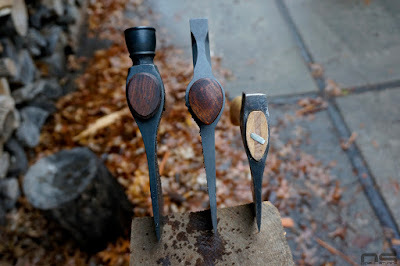 They are concave or flat in the cheeks with a flat centerline and somewhat abrupt (for an axe) transition into the eye. This is the primary reason I don't really see GB tools as "true" axes in the sense of the American Poll axe. It is not to say they are unworthy though, it is to say they are a tool that evolved for specific uses from the American Poll Axe. They are their own sort of axe. It's because of these similarities in price and design that I think there is a noteworthy comparison to be made. They do very much the same work. Note that the WBF in the center is very neat and tidy in design. Very angular and precise. Cutting edge length is also similar. But, these tools are not the same. You can see in the pictures that the Walk by Faith hawk is very neat, angular and geometric in design. The bit ends very abruptly at the eye which indicates the cutting and chopping function of traditional tomahawks. 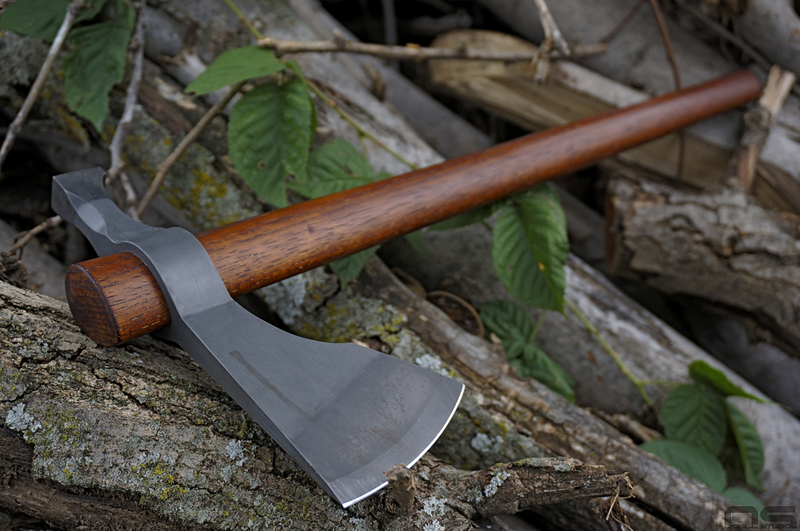 The Cold Steel Pipe Hawk has a more gentle sweep from the cheeks into the eye almost identical to the Wildlife Hatchet. In splitting, this transition becomes apparent when the piece being split reaches it. 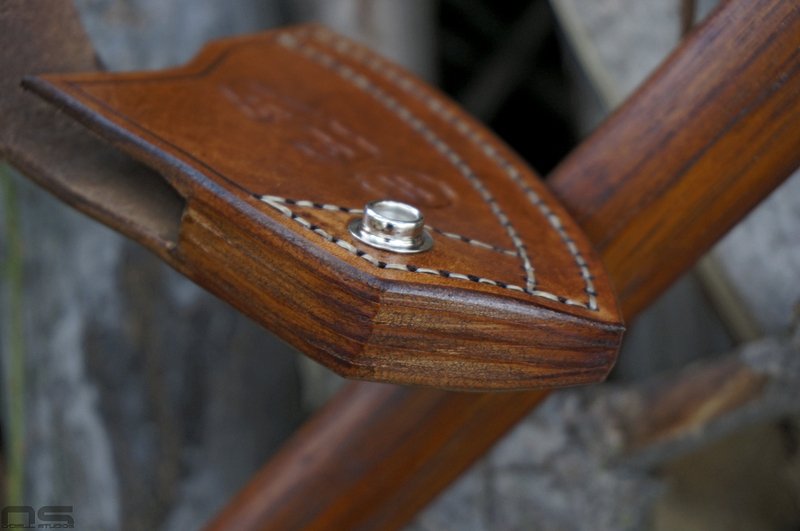 The tool can bind or stop, and often the wood tends to glance away from the tool, pushing it out of the split. None of these are especially good splitting tools in the context of a top-down splitting technique. However, the relatively wide bit and long stick lend them to what you could call flat splitting or lever splitting where you strike the piece in a horizontal orientation rather than vertical. While the GB is roughly the same weight, that weight is somehow much more compact and with a true poll the balance falls much closer to the center than a tomahawk. This isn't a positive or a negative in my view - they are just different. Tomahawks are bit heavy and historically had no poll at all, lending the design to throwing and simplistic construction. I admit that the balance difference is noticeable and takes some getting used to, but I feel either is perfectly useful. These three tools all offer a nicely dropped heel which I find very useful for carving - making tool handles or utensils or traps. However, I especially like the Wildlife Hatchet for these kinds of tasks. It feels 100% right in the hand in both balance and ergonomics. An axe handle is a very well made thing with its swell and oval or egg shaped cross section, and in my view is a benefit over slip-fit tomahawk handles. Though they are tear-drop in cross section, they are very slim and by design cannot offer any swell. The hatchet is just more secure in the hand whether it is keeping the tool in hand, or controlling it against twisting. However, I think it's fair to say that we're not talking about an insurmountable problem when it comes to tomahawk handles. 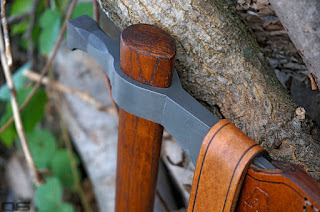 They work just fine, and no one ever said you couldn't hang a tomahawk exactly the same way you would hang an axe in order to enjoy a more hand fitting handle. To wrap this thing up, the bottom line is that while exploring the many similarities of two tools with different names, I can't ignore the differences that define them. In the end, one tool can't be declared better than another because functional differences are just that - differences - not benefits or weaknesses. 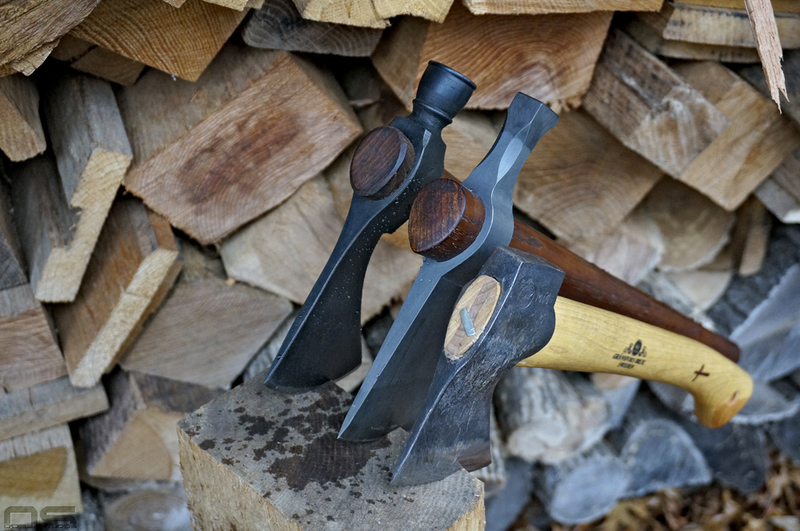 At the same time, tomahawks and the Swedish outdoors axes work well in similar environments, accomplishing very similar tasks. With any luck, seeing them side-by-side will help you decide which will work best for you if you are on the hunt for one. Thanks for reading!